Killed in attack near Cagnicourt. Samuel Newell was born at Burnt Head, Conception Bay Newfoundland on June 28, 1893, the son of William Newell. Sometime before the Great War Samuel moved to Toronto Ontario where he took up work as a Machinist. He address was given as 29 Redwood Avenue. Samuel enlisted in the 19th (Toronto) Overseas Battalion on November 19, 1914 and encamped with the battalion on the grounds of Canadian National Exhibition (a site which is still there today). Arrived with the 19th Battalion in England on May 22, 1915 and then to France and the front with the rest of the ‘new’ Canadian 2nd Division on September 14, 1915. Sentenced to 3 days field punishment No. 1 for 2 hours (tied to a wagon wheel) on February 14, 1916. Late with his battalion at The Battle of St. Eloi, or the ‘Battle for the Craters’ in early April 1916. While at the Somme he was accidentally wounded by the explosion of a bomb on September 14, 1916. He was taken to 4th Canadian Field Ambulance and then eventually to 8th Canadian General Hospital with a Shrapnel Wound to the Right Thigh. Arrived back at his unit on November 9, 1916 toward the end of the Battle of the Somme. Made L/Cpl. on January 26, 1917. 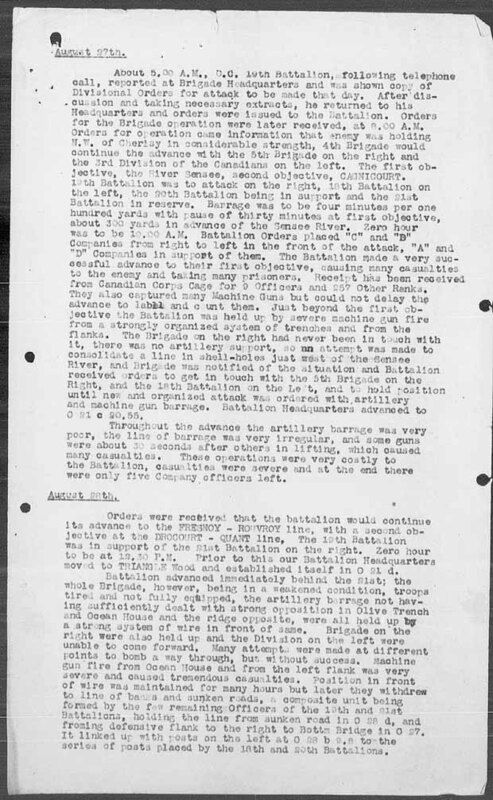 Attached to the 2nd Divisional Burial Party on August 1, 1917; a job that was likely very hard on a mans sanity. Newell was returned back to his unit in early September 1917. I’m certain he was very pleased to be redeployed. Promoted Cpl. at Passchendale on November 3, 1917, and A/L/Sjt. On November 9 and full Sergeant on December 3, 1917. Samuel Newell was 25 years of age. He was posthumously awarded a bar to this MM on December 16, 1919. Unfortunately no citation exists for his second Military Medal. He was buried in Valley Cemetery Vis-en Artois France. Son of William and Mary Jane Newell, of 29, Redwood Avenue, Toronto. Native of Burnt Head, Conception Bay, Newfoundland.